●Fix HS-360 on the mast or bucket of bulk earthmoving machines such as dozer, etc. 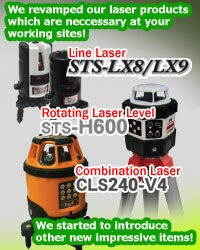 and use together with Rotary Laser Level. It is suitable for managing the operational height. ●Boost your efficiency for surface grading. Save your time dramatically. ●By using together with Remote Display, your performance will significantly increase.